Hello! 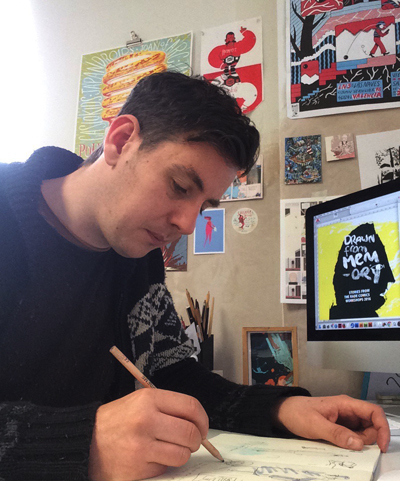 I’m Paddy Lynch a cartoonist, educator and graphic designer from Dublin, Ireland. My work embraces and explores the complicated and often contradictory experiences that make us tick and reveal who we truly are. My Last Day at Seventeen, published by Aperture Foundation. I wrote and illustrated a selection of comics in collaboration with acclaimed photographer Doug DuBois. Big Jim: Jim Larkin and the 1913 Lockout, a historical graphic novel written by Rory McConville and published by the O’Brien Press. Comics anthologies such as Zona (Comics Workbook, Pittsburgh USA) and š! (Kuš!, Latvia). I believe strongly in the unique power of drawings to communicate ideas on an emotional level and believe we all have the ability to access this. To this end, I have facilitated workshops and taught classes in comics and zines with groups such as The Irish Writers Centre, RADE, Fighting Words, Mindfield Festival, Dublin City Libraries, Fingal County Council Libraries, Wexford County Library, and Artzone. I am a founding member of comics collective Stray Lines, and the Dublin Comic Jam. An important part of my practice is that I self-publish my work in comics and zines, which I do alongside work by other artists under the imprint of Cardboard Press. I'm available for illustration and comics commissions, or creative comics and zine workshop facilitation.